Hark ye! A sampling of wares from Bass Clef's Doepfer-toting alter ego Some Truths who will be performing at the upcoming edition of The Outer Church on July 10th. Tickets available from Resident Brighton or here. Here is a selection of pieces by the remarkable Andie Brown aka These Feathers Have Plumes. Andie will be performing at the upcoming edition of The Outer Church on July 10th. Tickets available from Resident Brighton or here. ARE YOU GETTING THE WRONG SIGNALS? 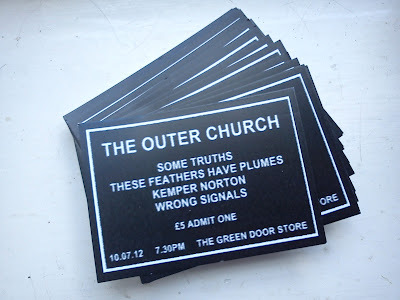 Introducing the music of Brighton's Toby Smith who will be appearing as Wrong Signals at the upcoming edition of The Outer Church on July 10th. Tickets available from Resident Brighton or here.